With all the troubles that Mexico has undergone in the past few years, it’s fortunate that the Pacific coastal town of Puerto Vallarta has stayed out of the spotlight. There’s no guarantee it’ll stay that way, but for now this resort city seems to be safe for visitors and expats alike. 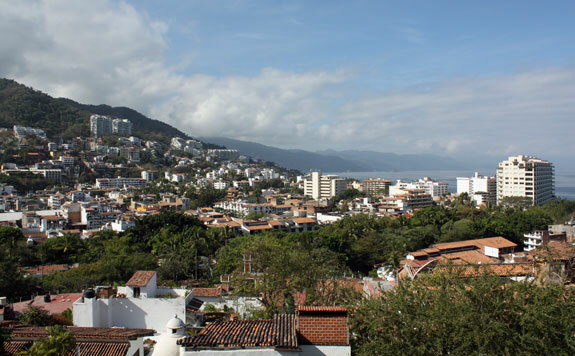 One of the more interesting aspects of Puerto Vallarta is that at its heart there is an actual Mexican town that is very worth spending time in on its own. This contrasts with most other Mexican resort cities such as Cancun and Mazatlan where the strip of tourist hotels is quite removed from any regular local life. Most people think of Puerto Vallarta as a beach resort either for a one-week winter holiday or perhaps a 6-hour tour on a cruise itinerary, and it’s certainly well set up for those things. Those looking for a sunny beach stay will have many dozens of choices, primarily near the airport, in the northern part of the city. You’ll find everything from 2-star budget hotels across the street from the beach to 5-star resorts where anything is available for the right price. There are also many hotels south of the main city. Along this winding road you’ll find mostly smaller, low-key resorts, some of which are all-inclusive and far enough from town that guests never leave the grounds. But the best part about Puerto Vallarta is that you can actually get a taste of proper Mexican culture while you are getting a tan. This city is very popular among the emerging Mexican middle class as well, so if you visit any of the bars or discos in the heart of town you’re likely to be in the minority if you are of European descent. No worries though because it’s still a resort town so nearly everyone will be on vacation and most places will not be dominated by intimidating locals. Knowing Spanish is helpful, of course, but they are used to English speakers so almost every restaurant, bar, or shop will be easy to communicate with. The historic center of town has plenty of souvenir shops, but there are also boutiques that sell fashions and designer items to locals so it doesn’t feel like you are drowning in kitsch like you might in Cancun or Hawaii. It’s worth pointing out that the best beaches are generally to the north of the main town, so if you want to lie in the sand it’s better to stay up there and take a taxi into town when you want to visit. There are some extremely nice hotels in the historic district and the so-called Romantic Zone just to its south, but there is no real beach through most of the center. Another pleasant fact about PV is that it can be done on almost any kind of budget. If you can spend US$200 per night for a hotel then you’ll get a 4-star deluxe resort for that money, but if you can only afford US$20 per night you can still find something in the form of a 2-star basic hotel at least a block or two from the beach. If you eat and drink at a pricey resort then you’ll be paying American prices if not more, but if you go into the town center you can find meals for under US$5 with no problem. It also won’t take long to find a happy hour beer or margarita special by just walking up and down the street, where you can get drinks for around US$3 each or even less.